Children will love creating, mixing, and storing their magical concoctions at this versatile outdoor kitchen. Featuring a removable rubber sink for wet materials and shelving for ingredients storage, this unit is ideal for encouraging exploration and experimentation with different materials. 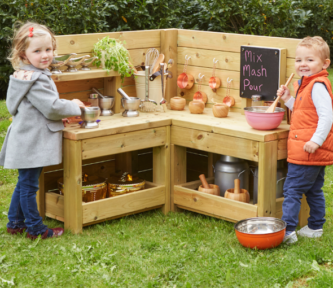 With multiple uses, this kitchen can be used for a variety of outdoor role play and messy play scenarios. Could you make mud pies or could the kitchen be made in to an outdoor cafe? Ideal for your messy play area or an outdoor home corner. Please note accessories are not included. Sink removes for easy cleaning. Made from pre-treated Scandinavian Redwood which is guaranteed against rot and insect infestation for 10 years.